Our modular cleanroom systems can be used throughout all demanding sectors to deliver quality assured buildings on time and on budget – and being modular they can be relocated or reconfigured for future flexibility as requirements change. Relevant standards and regulations We work to all relevant building standards and regulations including: HTM (Health Technical Memorandum), HBN (Health Building Notes), and SW Standards in Health. Benefits of offsite construction Faster build programmes and less time spent on site bring sizable savings in labour costs and prelims without compromising quality or sustainability. Off-site built cleanroom modules deliver consistent quality plus improved cost and time certainty for budget-conscious healthcare building projects. Completion times can be cut by up to 50%, so new facilities can be available in less time than with a traditional build. Because a high proportion of the build and fit-out is completed off site, on site time and labour is reduced, and there are fewer vehicle movements. This minimises disturbance to staff and patients and means a cleaner, safer site. Planning, design and manufacturing considerations Flexible modular building systems and internal finishing options to meet the specific needs of individual research and healthcare projects, from additional cleanroom space to specialist treatment facilities. Our modules are designed to meet the requirements of individual healthcare and research sites to ensure maximum fit out off site and minimum work on site. Transportation, site work and commissioning considerations As hospitals and universities develop; extensions tend to be in hard-to-reach sites. Precision Cleanrooms will conduct site visits and recommend the most efficient layout. 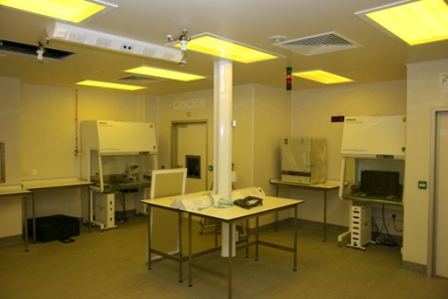 Even the most heavily serviced areas, such as cleanrooms and operating theatres, can be fitted out of site and tested, with clinicians invited to view their buildings in the factory to ensure their requirements are being met.